Excellent article, and I for one am a big fan of this method, even recording my GPX tracks as I go. One problem I have had, though you state that OSM will “Calm Down” is when I deviate from a route. On a 200km ride recently I loaded the section for the control I was aiming for (I always take the whole route, and a set of control to control shorter routes) having wanted to know the distance to the control, not the very end. However the system would not let me pick up from where I was, just tried to send me back to the start of the section I was on, which was damn annoying. Hi Eric, my inclination would be that when you start the routing and get to this screen, you should use the dropdown menu next to “From: “ to select “My Position” instead of the default which will be the start of the GPX track. Also, this may be affected by the navigation settings Pass along entire track (which I recommend is set Off) and Calculate OsmAnd route for first and last route segment (which I recommend is On). 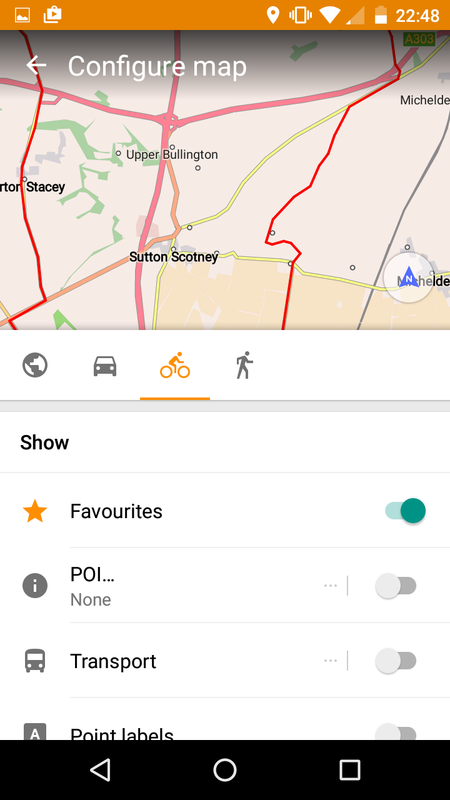 If you load the control locations as favourites, you might be able to use a single GPX file for the whole route. You can then set From=My Position and To=Favourite:Control then I believe OsmAnd’s route will just pick out the intervening section of the whole GPX, and the distance-to-go value will be the distance to the control. Give it a try and let us know! I have been trying my phone for navigation since 2012 when I did a 1200km ride in South Korea and noticed the Koreans were using their I phones for navigating. I also used a Garmin with AA batteries, but found it buggy and the screen too small. I have the Moto G 1st gen 4g and have installed the Nougat cyanogenmod system. I use quadlock with the phone with a back cover and although its waterproof in heavy rain the screen does respond erratically due to raindrops. I use a protective bag designed for phones given out free at a rock festival. Just cut a hole in the back for the quadlock. I also use the B&M luxos U and SP dynamo. 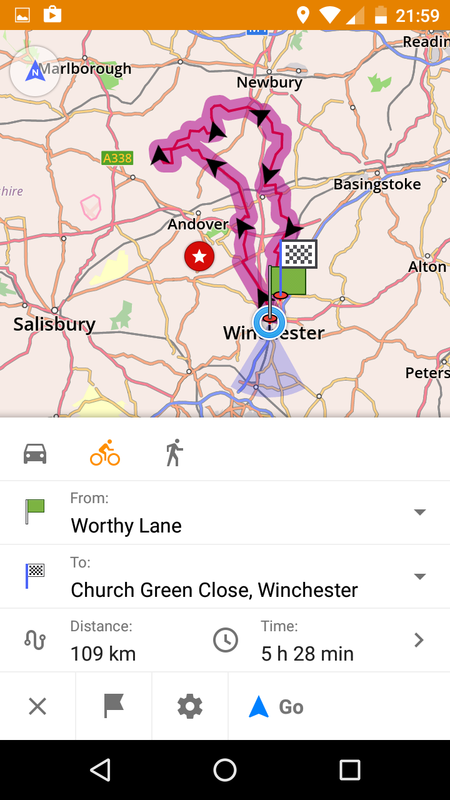 I also used ridewithGPS but have started using osmand+ and loading routes with Dropbox. 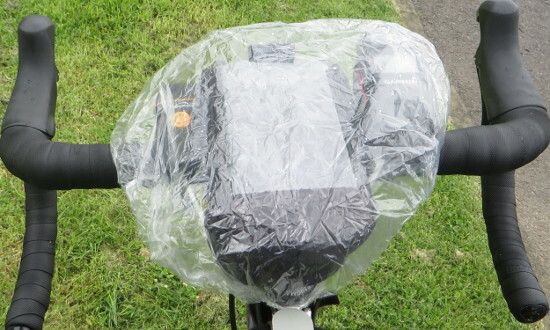 In 2015 I used an LG phone which I bought in Uzbekistan and with Luxos U and ridewithGPS did a 1200Audax. The phone was kept charged the whole trip. It was flat. I use pretty much this exact setup as well as offline WiFi/celltower geolocation to aid the GPS. You note that you still use Strava to record the route, this is what I used to do and still do on shorter training rides but for brevets I’ve stopped because I noticed strava’s battery usage is too high for me to justify when osmand is already running and sucking down so much juice navigating. I’ve forgotten the exact percentage but Strava’s battery usage made it look very inefficient at what it claimed to be doing considering GPS was constantly on anyway for osmand. It may be phone specific but I’d check your battery stats to see what you think. Biggest downside to Strava/phone compared to other device type for me is the lack of barometric altimeter data. Strava ignores it’s data when it is present anyway, GPS altitude data is poor and Strava’s altitude point data is terrible. Nice for inflating my ego though sometimes! Thanks, I’ll try the OsmAnd+ GPX capture and see what difference it makes to battery life. Interesting about the altimeter. I actually don’t know how OsmAnd populates the real-time display of altitude as I’m riding. Is it from GPS or does it use the mapping data? 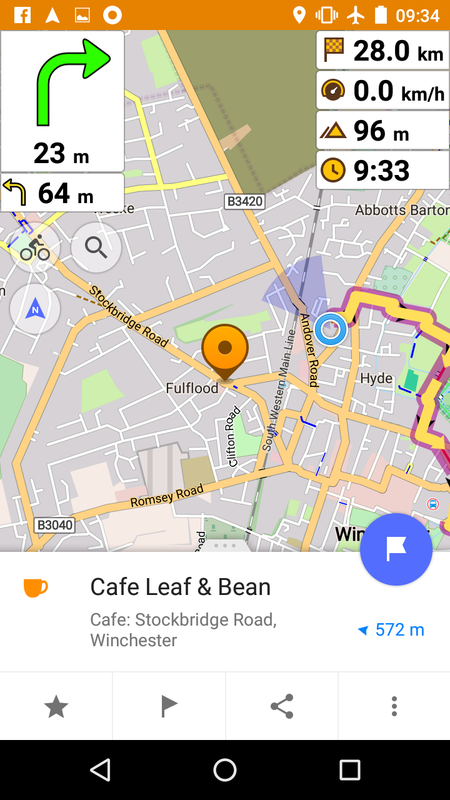 Great write-up, thanks, I am also a Motorola g3 fan – I have had good results in past with a combo of Google offline maps and cyclestreets. Will definitely give OSMand+ a go. I can’t believe I didn’t realise til reading this that GPS still works in airplane mode! Top battery life tip. I will try OSMand+ out on some long distance tours this summer. Perfect. Just what I was looking for. Thanks a lot! I use Moto G Quad lock and sandwich bags with a slit just big enough to fit over the Quad lock. 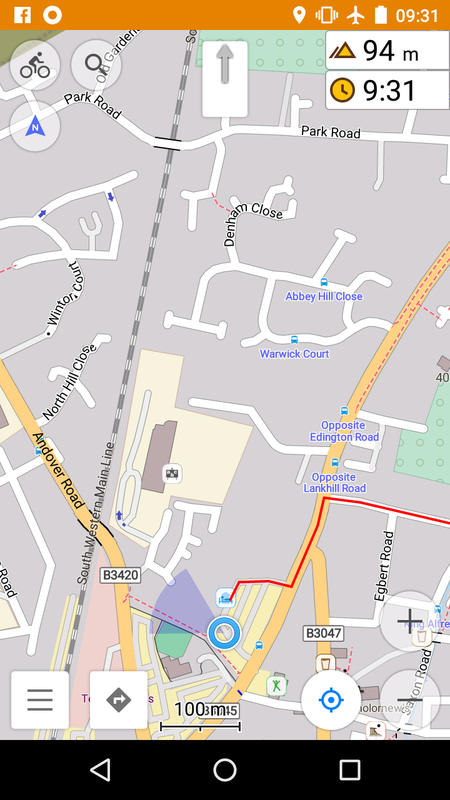 I can’t figure out how to stop OsmAnd+ trying to take me on proposed cycle routes? I’ve tried going to settings and hide proposed objects. When it does to me I switch routing to pedestrian mode. Any luck with the hunt for a waterproof case ? Thanks. Still using the NC17 but it’s getting tatty. I also have a silicone band fixing https://getfinn.com/en/ but I haven’t really put that to the test yet. 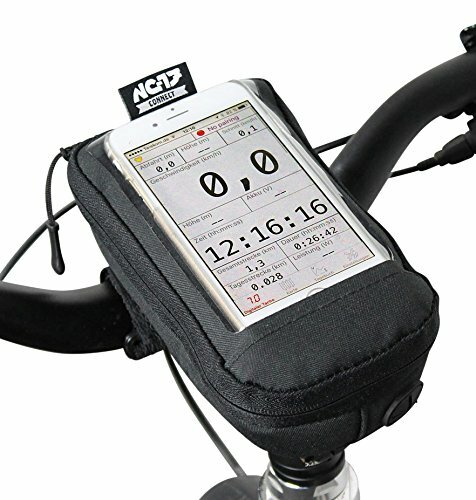 I have a new case: Aquapac small bike-mounted phone case. I got mine from SportPursuit for £14.99 but it seems as if they’ve sold out for now. There’s a review on road.cc that’s a bit lukewarm, mostly because they thought it it overpriced at £50, which I would agree with. I’ll update after I’ve had chance to give it a try. 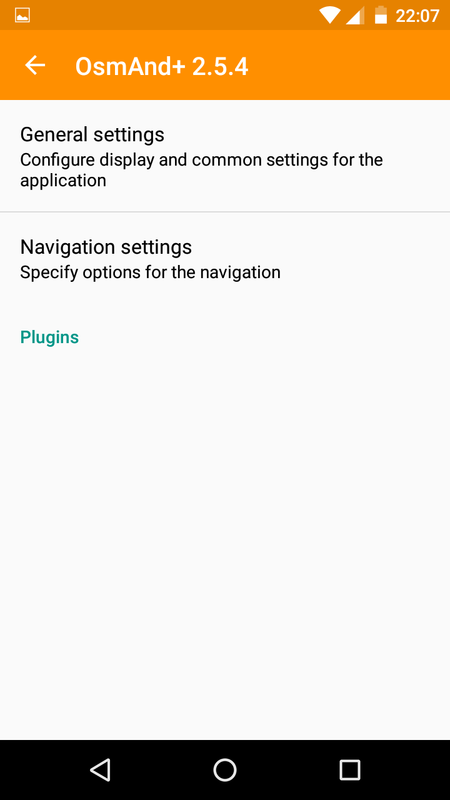 noticed that when importing a gpx file from ..say…google drive.. it imports straight into the app rather then going though the steps you have listed.this app gets better and better…. One other question/observation,would battery life improve if you just followed the box track rather then go by turn-by-turn directions. I haven’t tested it, but I suspect you are right. The phone would have less to worry about if you are not asking for turn-by-turns, so likely use less battery. Personally I find it quite helpful to have the voice announcement to remind me of upcoming turns, and I nearly always carry an external battery pack connected via USB cable, so I’m not so worried about extending battery life in this way. Osmand. I’m using it intensively for almost a year. always on. I can receive a phone even while riding. and it wasn’t easy for me to find all its hidden features. That’s very interesting Jacek. I read your blog post and, you’re right, it’s quite eccentric but inspiring too! I will update the main text here to link to it. Thank you Rob for tidying up my post. It probably got messed up when I pasted it from my notepad. What I find most precious in OSM and Osmand is that they let me to discover new roads even close to my home. Car traffic in my region (Southern Poland) is really nasty and finding road without cars is a challenge. That’s also how our brains work. We tend to follow roads we already know.. A little bit of technology can help us to break up that circle. Using watch for navigation (and calls) may look kind of geeky but with screen so small it doesn’t need much energy so it makes a sense for me. On longer trips I take backup phone. It’s better for planning. When kayaking I also take with me folded solar panel. Recently they got so effective that in the full sun I can recharge my big phone in less then an hour. That way I can afford to read books or check the news in the evenings. What a life! Just done a mini tour with my G3 and quad lock and can confirm the phones water resistance. One thing to bear in mind is that because of the curved back of the phone and therefore the case the pad will not stick on flat so I used some araldite to fill in the gaps. This also has the benefit of making the case hold the phone s bit more securely. Am planning a 2500km meandering ride Amsterdam to Linz in mid 2018. To avoid carrying tons of maps I aim to go electronic off-line as much as I can. 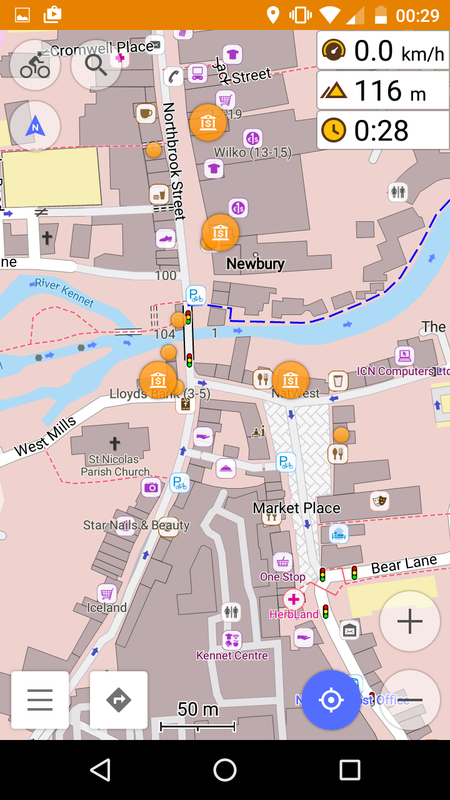 So I’m experimenting with OSMAND and LocusMAP. Your info above is extremely valuable an I thank you for that. I have purchased a used Nokia Lumia 920 – very bright screen and easy to use in strong sunlight. Won’t need a SIM card. On this I’ll run OSMAND – I wish there was a way to make the turn by turn navigation arrows bigger (even fill the screen). I also have my main Android phone with LocusMap and audio instructions. Smart phones make the best bike computers and with all comms turned off the battery lasts OK. Lots of great cycling apps for phones. Excellent, glad you found the post useful. I feel it probably needs an update, especially in regard to waterproof cases (I am now using an Aquapac bike-mounted case). Good luck with your ride in Europe, it sounds great! We have ridden the Danube and the Rhine, which I suspect will form part of your ride. You might find some of our trip reports on this site interesting or useful. 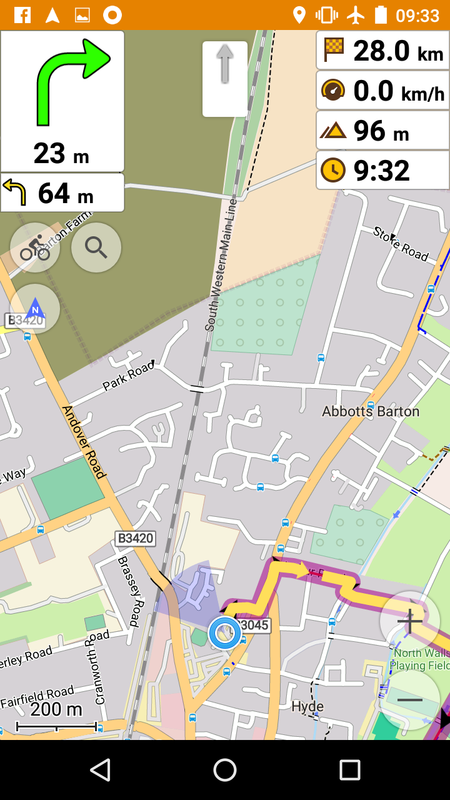 Elevation profile can be seen when you go to ‘my places’, select track, then tap ‘show on map’ bottom right. In think it cannot be shown while navigating though. The only missing feature is the ability to show heart rate! We too are using a Moto g (the 5 g plus) and it works great with Osmand. The one and only issue is that we have trouble seeing the screen in sunlight. What works best for us is using night mode – the light route markings against the dark background seems to do the trick, at least for us. Thanks for the comment. I am also finding it increasingly hard to see the screen in sunshine, without turning brightness up very high, which hits battery life. Maybe my Moto G3, which is now more than two years old, is deteriorating in battery life and screen brightness. And the Aquapac case I now use also dulls the screen somewhat. I will try the night mode idea, it could be a really helpful way to deal with the problem. 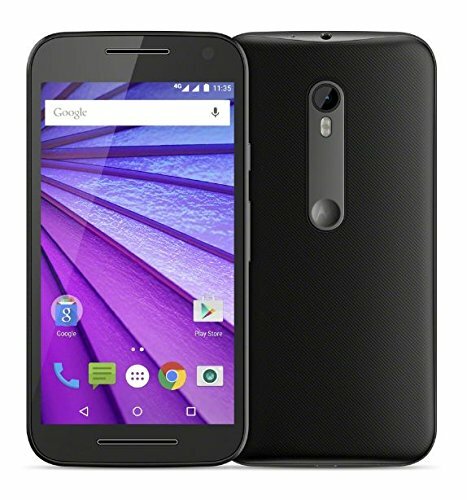 Meanwhile also looking at ruggedised phones from Mantistech as a possible replacement for the Moto G3, which has certainly earned its keep. Hello I am cyclotourist since 1986. At 63, I left the right mechanical ATV for an electric bike. For decades I used the road map. So, to live with his time, I am mastering OSMAND +. Your experience through this article brings me a lot of advice. Marc, it’s lovely to hear that you are enjoying cycle touring again. Glad to hear that this information is useful. Thanks a lot for your paper. 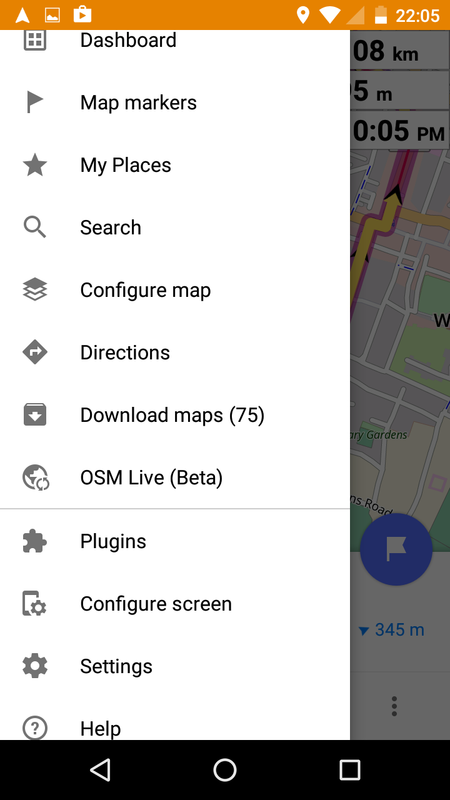 I plan to use OSMAnd during trips to design a route/track in GPX format and transfer it to my GPS device (Garmin 62s). I have a Moto G4 that is capable of this. 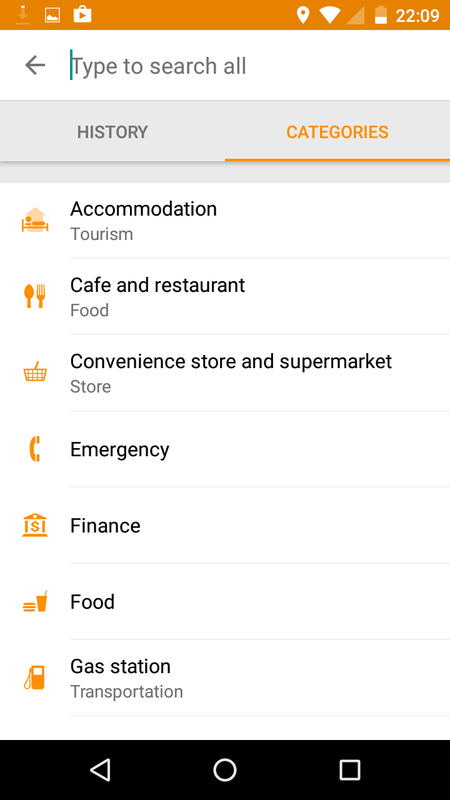 This avoids the problem you describe of using a phone to navigate with issues concerning rain protection and battery exhaustion. I now have more or less mastered the art of building a GPX track in OSMand. and transfer it to the Garmin device This should enable me to divert from a planned trip that (a track on the Garmin) when necessary..